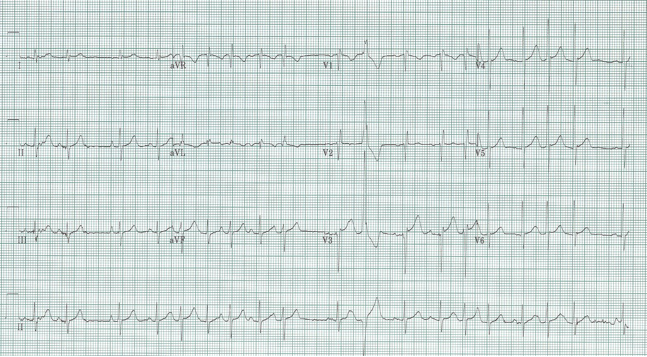 65-year-old woman with COPD exacerbation. Rhythm: the overall rhythm is irregularly irregular – either atrial fibrillation…or, the other irregularly irregular rhythm. Multifocal Atrial Tachycardia (MAT). The rhythm is multifocal atrial tachycardia (MAT) as there are definite P waves discernible in front of some QRS complexes, of varying morphology and PR interval. The wide-complex beat seen slightly after the middle of this tracing is most likely an aberrantly conducted supraventricular beat based on Ashman’s prediction. Notice the long R-R interval followed by a short R-R interval resulting in a RBBB morphology wide-complex (notice the tall R-wave in V1).